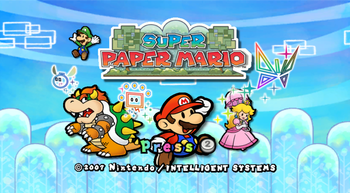 Super Paper Mario was the third game in the excellent Paper Mario series, which takes the characters from the Super Mario series and presents them in a ‘paper cut out’ kind of art style while also telling much deeper stories than the main series ever does. Controversially, this may just be my favourite Mario game, or, at very least, my favourite 2D Mario game. That took quite a while to explain and, really, I’m only giving the most basic of introductions because this game’s story really is rather complex. I only wish that more games in the series featured a stronger plot focus. Not only is the story filled with lots of humour (especially when it comes to Bowser) but also lots of emotions, and at times it is really rather sad, which is very unexpected but very welcome. I also liked the fact that it was dealing with the grim subject of the end of all worlds; I’m someone who likes to connect the dots and knowing that Mario has crossed over with virtually every other series around, it really made me feel that I was saving all universes. But, anyway, this is a game and I am sure you’re keen to hear about how it plays, rather than just its story! Unlike the first two Paper Mario games, this one is actually a side scroller. Sure, you’re able to explore the world quite freely, but it is still 2D and has a lot in common with the older Mario games when it comes to gameplay. One particular part of the game seems to be especially dedicated to the past and, as well as being full of funny/clever references, it also features many attempts to replicate the feeling of those games too. Significantly, however, you are also given the ability to flip to a 3D perspective whenever you need to; I found this to be very innovative and at times, very fun. Occasionally, however, it did feel a little under-utilised, and, in some ways, frustratingly limited. There are also several RPG-elements; you can level up to increase your HP and strength; you also use money to buy items and so forth and there are several side-quests to do as well. Mario’s not the only playable character either; you’ll later get others with their own unique abilities, but I shan’t spoil it. It’s just such a fun game with an excellent story. I’ll admit, the second Paper Mario comes very close, but I think this one edges it out. There’s something compelling about the story and the doom-filled tone of the game contrasted with the light-hearted humour of many of its characters. On top of all that, it’s fun too, which is just as important. It’s entirely standalone, story-wise, so don’t worry about getting it without playing the other Paper Mario games first.